Dr. Tommy John has his father’s famous name, and an important message for parents. Dr. John played professional baseball, and, following his playing days, has pursued a career that combines his passions of sports with his professional background as a Doctor of Chiropractic and a Master’s Degrees in Heath and Exercise Science. Owner of the Dr. Tommy John Performance and Healing Center, Dr. John published his book, Minimize Injury, Maximize Performance: A Sport’s Parent’s Survival Guide, in June 2018. Dr. John shared his thoughts on the importance of sports, benefits of baseball and softball, and more, with Little League. Why is it so important for kids to get involved with playing sports at a young age? Sports provide young athletes the opportunity to challenge and strengthen their bodies on so many levels, thanks to a plethora of movements on different surfaces at varying velocities, angles, and amplitudes. The more you can keep the body guessing, the more it has to adapt and evolve as a result. They also challenge the mind and body with rules and tactics that force you to problem solve and express creativity on the spot, two areas that are extremely beneficial to the overall development of a young athlete, both on and off the field. Sports create an environment where young athletes can learn the benefits of socializing, teamwork, having a work ethic, and goal setting. They can also help kids learn how to deal with failure, as well as the initial concepts of grit, determination, and persistence. 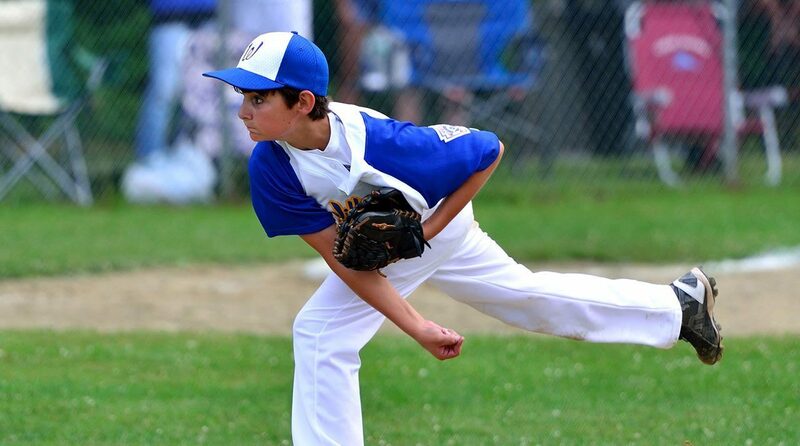 What are some benefits of baseball and softball that most parents never consider? Both sports are great for teaching hand-eye coordination and training-depth perception, two areas that come into play throughout all areas of life. But, what many people may not realize, is that playing baseball and softball emulates the same type of environment we spend most of our lives in. There are multiple possibilities of what could happen when a pitch is thrown and a player has to be ready to respond to every possible option, whether it occurs or not. In that moment, a player must immediately react through a short burst of all-out effort. But once that moment is over, there’s a recovery period where a player needs to calm everything down and prepare their mind and body for the next possible situation. It’s a scenario that presents itself repeatedly throughout the hundreds of pitches that occur during an average game, and throughout our everyday lives. Baseball and softball are also fantastic at helping kids process failure. When you look at a player’s batting average, even the best in the world only succeed three out of 10 times. That constant failure may not sound healthy, but through baseball or softball, it is. When a young athlete fails, they must not only process their failures, but then adapt from those failures—and that’s paramount in life. When you think about some of mankind’s greatest achievements, those success stories typically follow a period of struggle and perseverance. Playing baseball and softball from an early age and learning the valuable life lesson of staring adversity in the eyes and beating it back, prepares kids for many of the stages that life will demand of them down the road—long after the glove goes into the closet. Can you give an example how parents should ‘rethink’ how their young athlete spends tier time when not playing ball? One area is relying on technology too much, which can impact things that most people don’t consider in terms of actual sports performance. For one, it can suppress their immune system in the same way that constant stress does, since engaging with technology too often each day has been found to trigger the sympathetic nervous system (the fight or flight response). It also makes them less aware of their surroundings and inhibits their posture in a way that can actually shut down certain muscles and destroy their biomechanics. While there are a variety of ways to minimize the damage that too much technology can cause on a player’s performance, one trick I use a lot (and see incredible results from) is simply teaching young athletes how to position themselves correctly when they use it. When standing: Their shoulders should be back and down (not slouched forward) with their core muscles tight and whatever screen they’re staring at positioned at eye level— even while texting. On their stomach: Have them lie with their head up and elbows bent to support their torso, or with their chin resting on their hand. What are your thoughts on specialization vs. multi-sport participation? When it comes to whether or not a young athlete should play only baseball and/or softball or participate other sports throughout the year, the research speaks for itself. Multi-sport participation injury-proofs them. A new study by the University of Wisconsin School of Medicine and Public Health, which included more than 1,500 high school athletes, found that athletes who specialized in one sport were twice as likely to report a lower extremity injury as compared to those who played multiple sports. Another recent study published in the American Journal of Sports Medicine has those numbers even higher, claiming that spending more than eight months annually in one sport leaves young athletes nearly three times more likely to experience an overuse injury in their hip or knee. Multi-sport participation increases their chances. If you kid has high hopes to play at the next level, their chances surprisingly decrease sticking with a single sport. One recent study found that those that specialize were more likely to play fewer games than kids with more varied interests. And, according to the American Medical Society for Sports Medicine, 88 percent of NCAA Division I male and female athletes participated in an average of at least two or three sports when they were kids. Multi-sport participation makes better adults. The greatest reason for mixing in other sports with Little League, beyond keeping them healthier and increasing their chance of success, is that you’ll turn out a better human being as a result. In a multiyear study of more than 14,000 12th graders, it was found that youth athletes who participated in multiple sports as kids were more likely to have healthier behaviors later in life such as: exercising vigorously each day, getting at least seven hours of sleep regularly, being less likely to smoke, being more likely to eat green vegetables. They also seem to have higher levels of self-esteem and social support, and lower levels of loneliness and self-derogation. How can parents take action to help prevent some of the common injuries facing youth sports today? Being that most of the injuries experienced in today’s youth sports epidemics are degenerative in nature, such as stress fractures in spines, elbow injuries, and torn ACL’s (versus traumatic injuries like broken bones, bruises, and lacerations), the injuries seen in baseball and softball are almost completely preventable at this stage in their development. Rethink: Are their extra-curricular activities (when not playing sports) and habits helping them perform at their best? Rebuild: Are they conditioning their bodies in the right way when they’re not playing sports? Replenish: Are the foods they’re eating ‘healing’ their bodies all day long? Recover: Are they getting enough time to recover—or are you just assuming that because they’re young, their bodies are resilient? If you can’t answer ‘yes’ to all four questions—or if you’re uncertain how to answer any of the four—then your young athlete is most likely missing out on staying as healthy as possible, as well as having as much fun as possible. That’s because if you’re not focused on all four at the same time, it’s virtually impossible for your young athlete to remain not only their healthiest and less prone to injury, but it’s also virtually impossible to prevent burnout, disinterest, and an assortment of things that can lead them to quit their sport. Prevalence of Sport Specialization in High School Athletics: A 1-Year Observational Study. Bell DR, Post EG, Trigsted SM, Hetzel S, McGuine TA, Brooks MA. Am J Sports Med. 2016 Jun;44(6):1469-74. A Prospective Study on the Effect of Sport Specialization on Lower Extremity Injury Rates in High School Athletes. McGuine TA, Post EG, Hetzel SJ, Brooks MA, Trigsted S, Bell DR. Am J Sports Med. 2017 Oct;45(12):2706-2712.